Thank you Nancy Medina for this award. Nancy is a very talented and gifted artist. I am truly honored. This award asks you to list seven things you are passionate about, and share this award with other passionate artist friend. 1: My family, first and foremost, I have been blessed. 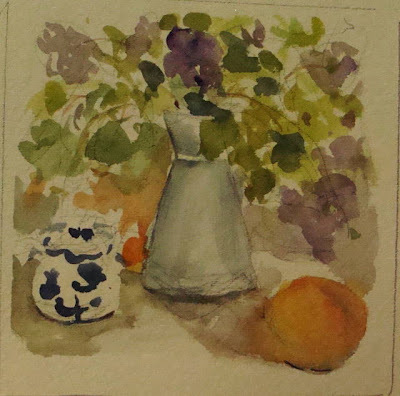 A thank you to Liz, over at Liz Holm Paintings, for sending me the Lemonade Award. That was very kind of you. 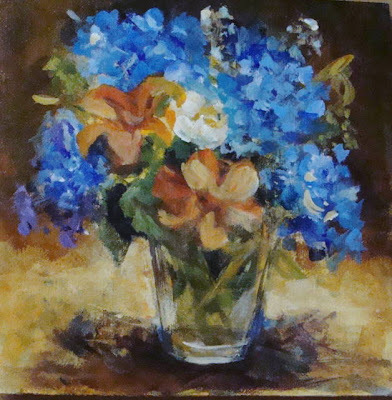 Nancy over at Nancy Medina Art, I also want to thank you for sharing A Passion for Painting award with me. Liz and Nancy are gifted artist, and I am humble by their kindness in sharing these awards with me. O.K. It's done. 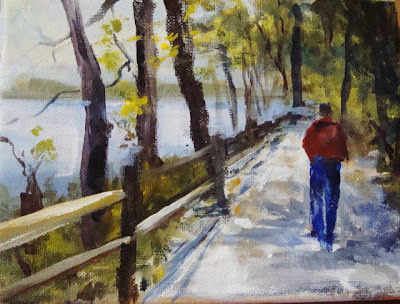 Going the Phoenix Fine Art gallery in Bellport. Wow, this is totally different. I still have to put the people, it really is a private beach in St. James. 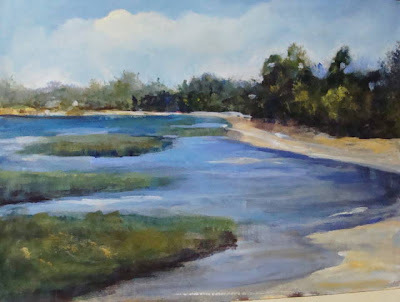 I need to work more on the shore line and the marsh. I love this location, this and the Setauket bridge. One of these days, I'll capture the essence of both places. 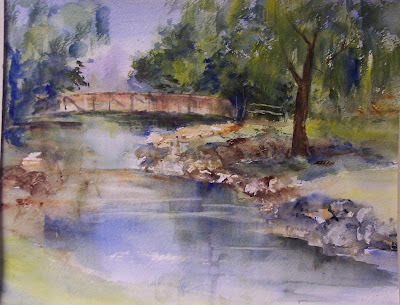 Maybe this summer, I'll just paint en plein air. I changed the composition, just want to check it out. I added the figure in this one. Still needs work. I have to clean it up a bit, a little to choppy. Of the figure needs work also. It helps seeing the painting on the post. Hopefully I'll finish this one today. 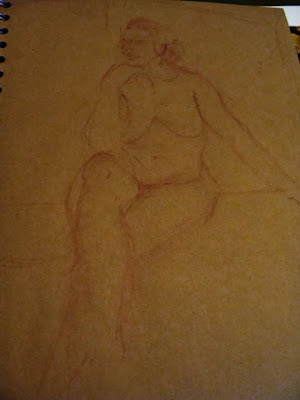 This was at the life drawing workshop. Judy Davidson, very talented portrait artist was sitting next to me. I loved every minute of the three hours. Can't wait for this Thursday. I hope I feel better. These are quick gesture studies. 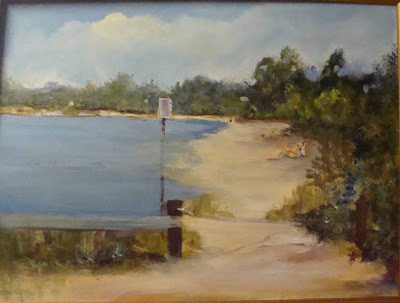 Exercise taken from Mood & Atmosphere in Oils by Carolyn Lewis. 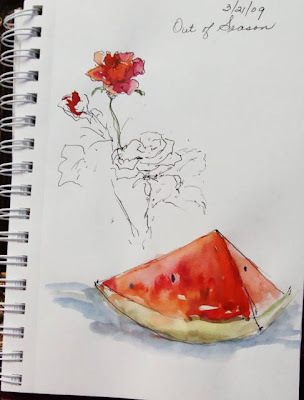 I did the studies in watercolor, too tired to work in oils. Out of Season. 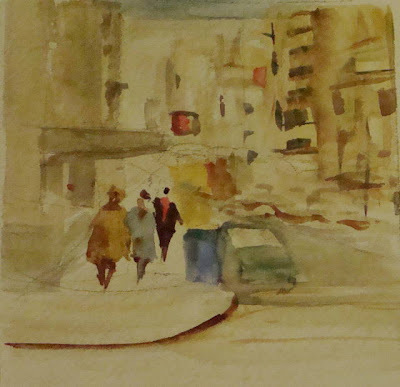 Pen and ink and watercolor wash. Came down with a bug, my grandchildren shared with me. So I don't have energy to paint, so, I'll just doodle. I used a sepia pencil on craft paper. As you can see, my drawing is very tentative. Not much confidence in this area. 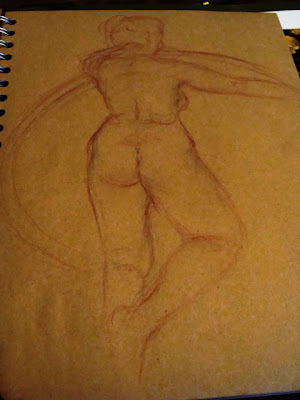 Last Thursday I went to a life study workshop. I want to get back to figure and portrait painting. So it will be trial and error for awhile. 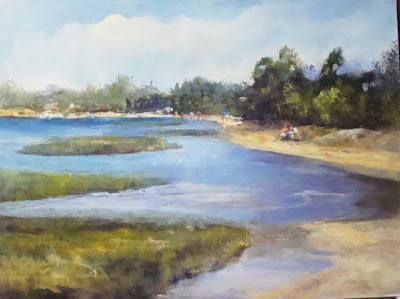 East Setauket bridge, one of my favorite places to paint. 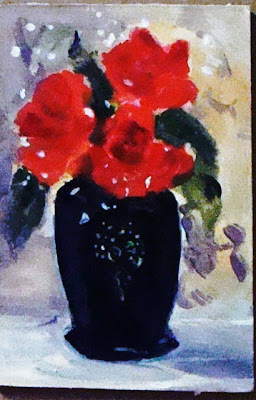 I painted this one 10 yrs. ago, thought I post it, been busy working on paintings for up and coming shows. 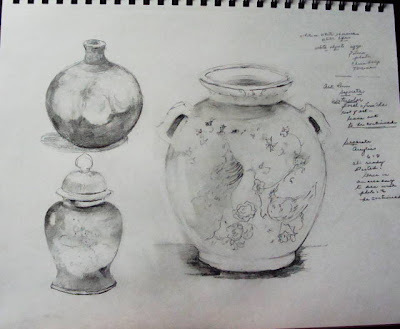 Today's sketches of household items. Sometimes I just want to draw. The days are going by so fast. I really can't wait for the spring. 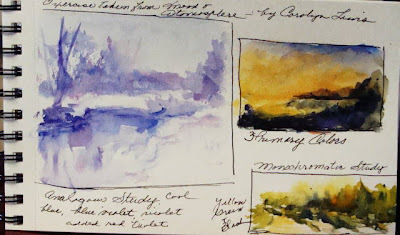 Looking forward to plein air painting. If anyone can give me some tips on equipment I would appreciate it, I have equipment on back order. Another study. Hopefully tomorrow I will get busy and start concentrating on the up and coming shows. This computer can become addicting. 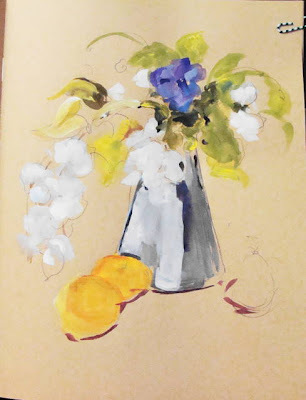 Sunday doodle in gouache, primary colors. Still working on this one. Acrylic on 6x6 linen on board. 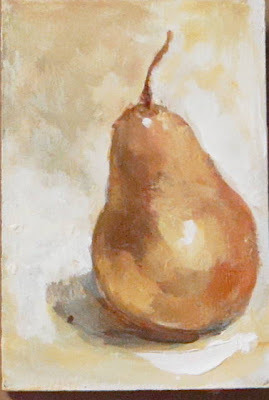 Pear study in acrylic using Jan Blencowe 's tip on painting in the 3 primary colors. Lots of fun. Kim VanDerhoek, thank you for the great tips. 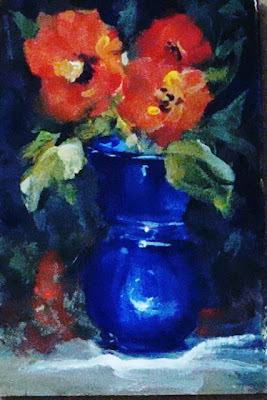 This painting has been in my studio for the last 2yrs. Do I add the keep out sign, or remove it. Also the shore line needs work. It's a beautiful location, a private beach in St. James. I really want to finish this in the near future. Happy Monday. After spending most of my time on the computer last week, I promised myself, art first, then the computer. I joined ArtBistro, and Twitter. Lots of fun. But I really need to get back to my work. I love blogging, and posting my work. I call my blog my little nursery, I plant all my seedlings of ideas for future paintings. Manhattan in the 70's. 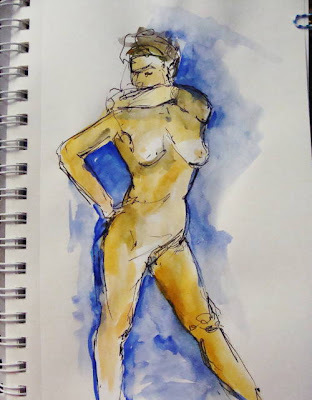 This is a gesture study in watercolor. It's Monday, and I just want to play with ideas. 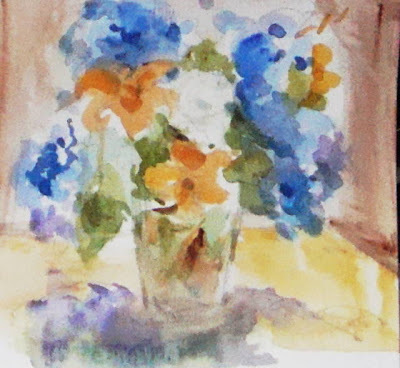 Abstract study of floral arrangement. Hopefully this will make a good still life painting in acrylic. Three oak trees outside my dining room window. 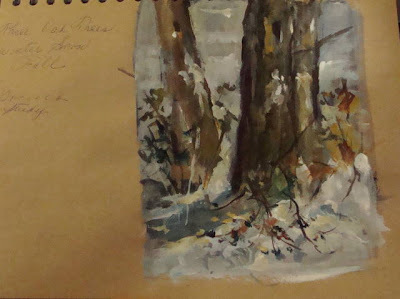 If you want to see a beautiful painting of a tree check out, Dewberry Fine Art blog. 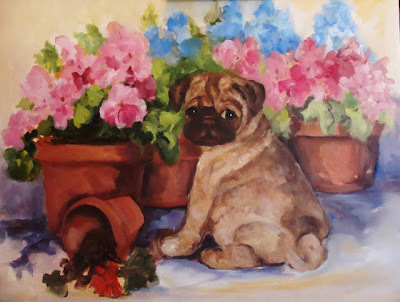 And for all of you who got slammed with the snow check out Nancy Medina Art blog. Beautiful floral paintings. This little vase was given to me from my mother-in-law, God rest her soul. 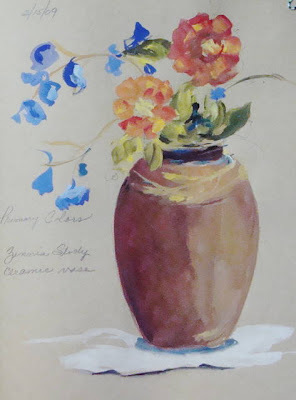 I always loved this vase. This is just a little study. Hope to finish it, this week. Someone once said "If it's all wrong, then it's all right". O.K. , so in this case wrong is wrong. Long Island is getting slammed with a snow storm. So far we have 14"and still falling. I do love snow, but this is a bit too much. Back to my studio, to try another painting.